Purple is the symbol of royalty and wealth. It also represents wisdom and spirituality. Since it does not often occur in nature, it can sometimes appear exotic or artificial. 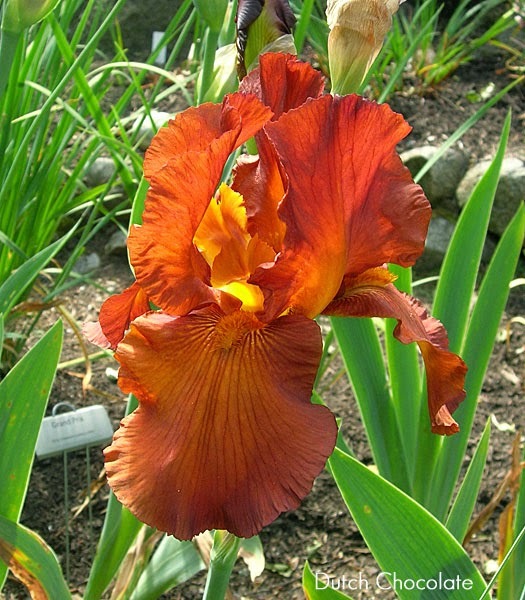 'Paul Black' (Johnson, 2002) HM 2005, AM 2007 and Dykes Medal in 2010; 'Feature Attraction' (Schreiner, 1994), Winner of the 1994 President's Cup at the American Iris Society National Convention in Portland Oregon; 'Poem Of Ecstasy' (Hager, 1997) HM 1999, AM 2001; 'Stepping Out' (Schreiner, 1964) HM 1965, AM 1967, and Dykes Medal in 1968; 'Magic Man' (Blyth, 1979); 'Allegiance' (Cook, 1958) HM 1958, AM 1960 and Dykes Medal 1964; 'Like Wow' (Schreiner, 2012); 'Glistening Icicle' (Maryott, 1982) HM 1986; 'Gypsy Lord' (Keppel, 2006) HM 2008, AM 2010 and Wister Medal 2012. According to the the ProFlower Blog, "the iris’s history is rich, dating back to Ancient Greek times when the Greek goddess Iris, the messenger of the gods and the personification of the rainbow, acted as the link between heaven and earth. Purple irises were planted over the graves of women to summon the goddess to guide the dead in their journey. 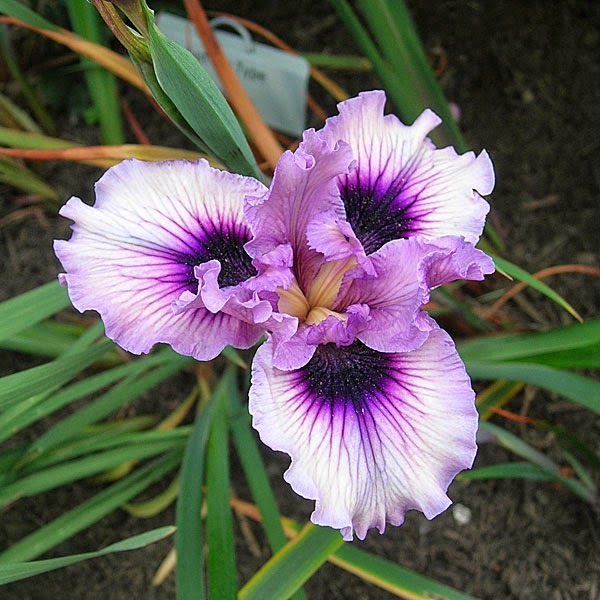 Ancient Egyptian kings marveled in the iris’s exotic nature, and drawings have been found of the flower in a number of Egyptian palaces. 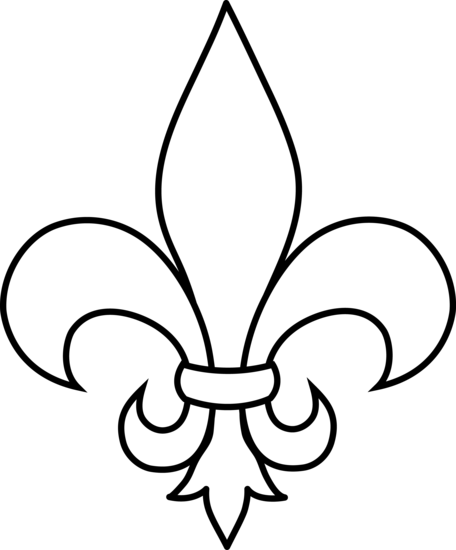 During the Middle Ages, the meaning of irises became linked to the French monarchy, and the fleur-de-lis eventually became the recognized national symbol of France. 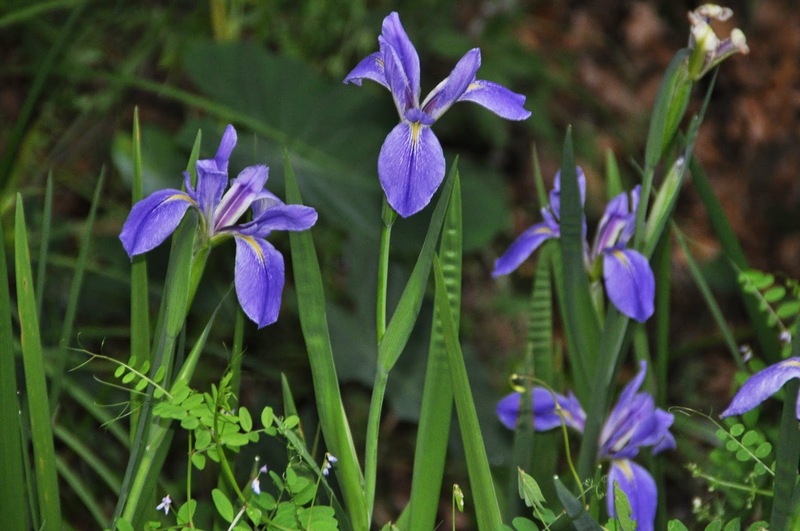 From their earliest years, irises were used to make perfume and as a medicinal remedy. Today, they are primarily seen in gardens, in bouquets, and in the wild all over the world." I love purples of every hue and shade. 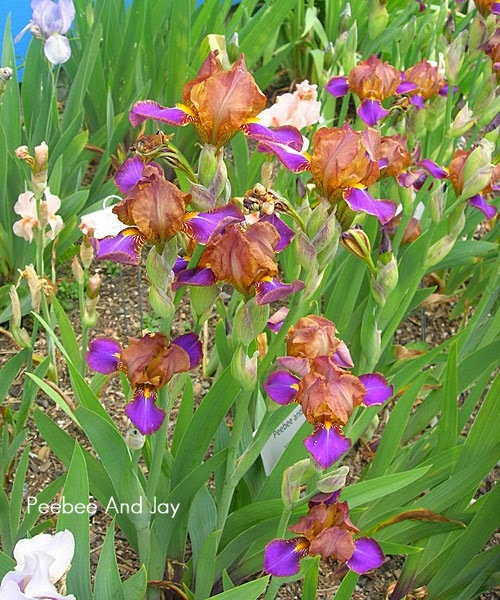 I have so many favorite purple irises that I will have to present them in two parts, like I did with my favorite pinks. Click Here (Part 1) and Here (Part 2) to review the pink blogs. I tried to find 'Angelique' on the American Iris Societies WIKI but couldn't. I love its orchid coloring and it grows well for us in zone 6b. I was given a rhizome by my friend's sister, a woman who started collecting many years before I got my start in the mid '80s. 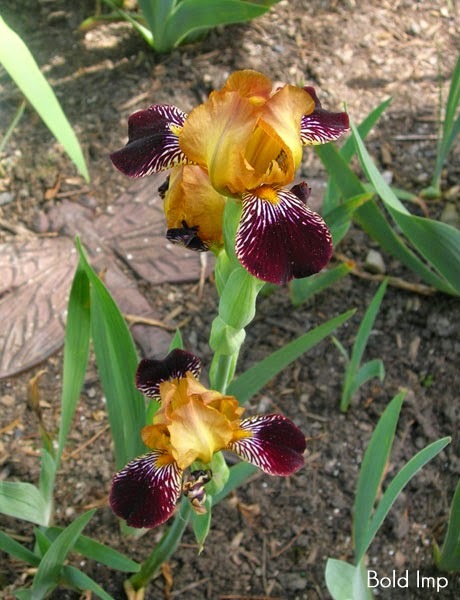 Another friend gave me a rhizome of 'Boysenberry Buttercup' and it is a very nice iris. I like how it looks in a vase, where it compliments my maroon carpeting. 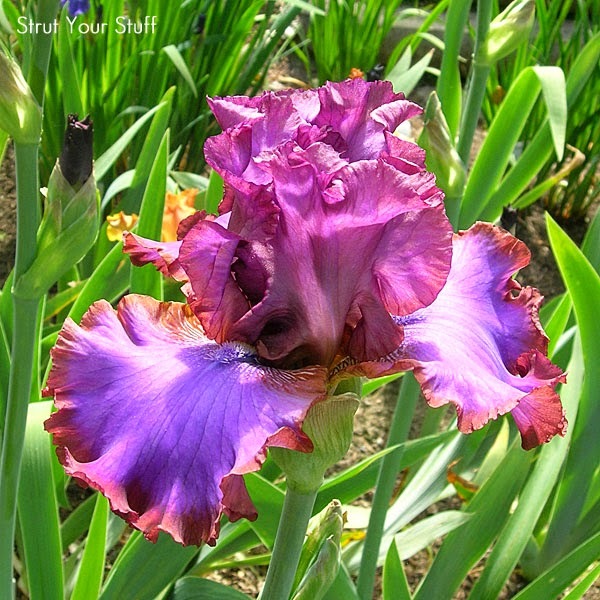 Other favorites include 'Into the Night': a fine example of a rich royal purple color. The catalog lists 'Versailles' as a blue but I also see shades of lavender. The flaming orange beards are a wonderful complementary contrast. 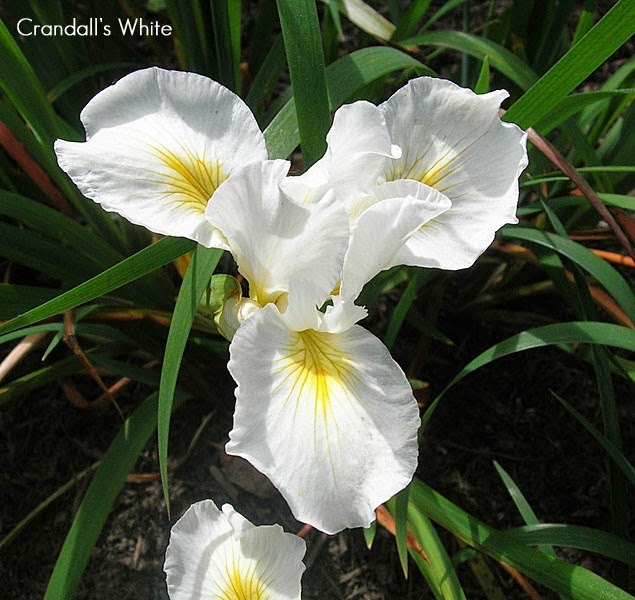 'Rhinelander' is a great iris to have in your garden. It grows vigorously, it has good color and substance. Someone said to me that they liked it because as it ages it is still pretty because it almost looks "antique". Notice how both old and new 'Rhinelander' blossoms are beautiful. This is our "share" iris garden. These are the extras that we plant here away from all the others so that when friends come to see the irises they can dig some up and take some home from these "share" rows. (We don't sell or mail irises). 'Conjuration' won HM in 1991 and AM in 1994, the Wister Medal in 1998 and the Dykes Medal in 1998. My mother loved purple, my three sisters and an aunt love purple, and I guess it must be in the blood because I love purple. I wear purple, I decorate with purple, and the carpeting in my bedroom is plum colored. I even have a purple and lime green Christmas tree! 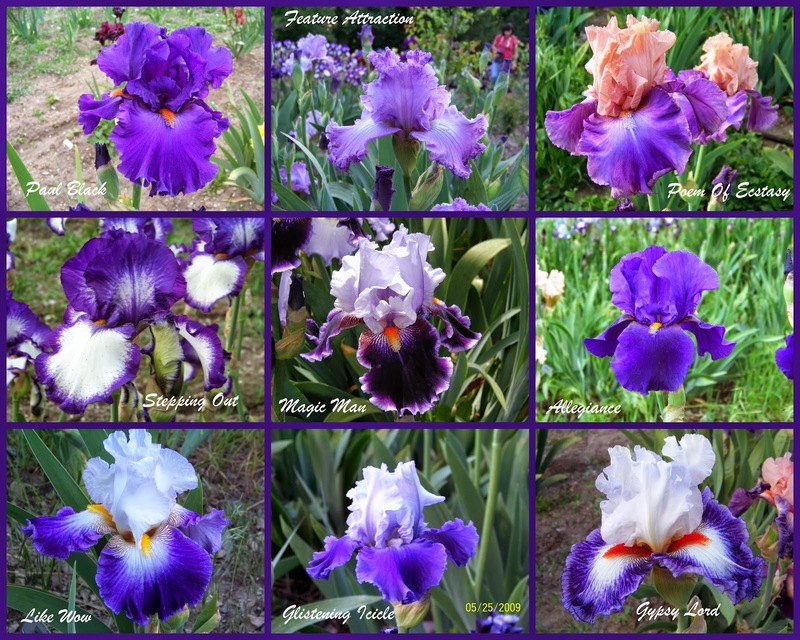 Do you have a favorite color of iris? Are there some colors that you don't like? Every time I exclaim that I love a particular iris my husband says "Dawn, let's face it, you love all iris." He is right, but I love purple just a little more. In 2013, Ernie Lamont, one of the newer members of the Gisborne Iris Group, decided to try his luck growing irises hydroponically. Knowing how little bearded irises like to have wet feet, many of the club members were skeptical about the experiment. But Ernie had been successfully using hydroponics to grow vegetables and other plants for close to fifteen years, so if anyone could give a fair test to the technique, he would be the one. Ernie's system is located in his greenhouse. He uses materials anyone might have at hand: old plastic or metal rain gutters and wooden troughs covered in plastic sheeting constitute the channels. The pots and plants stand in a 50/50 mix of pumice and pea gravel about two to three inches deep. The nutrient rich water is pumped up to one end of the channel and runs downhill into tanks which are low, forming a short waterfall, which puts oxygen back into the water. The pump starts up every two hours and circulates the water for 15 minutes, then turns off, and the water drains back into the tank. After two years, the results of Ernie's experiment have been phenomenal. Instead of rotting to death as many had feared, his irises have flourished along side of his vegetables. The rhizomes are not covered with water; only the roots get flooded. He has planted daffodil bulbs in the gravel as well, although he treats them as annuals. He feeds the irises a weak nutrient solution all year and with boosts in the months required. 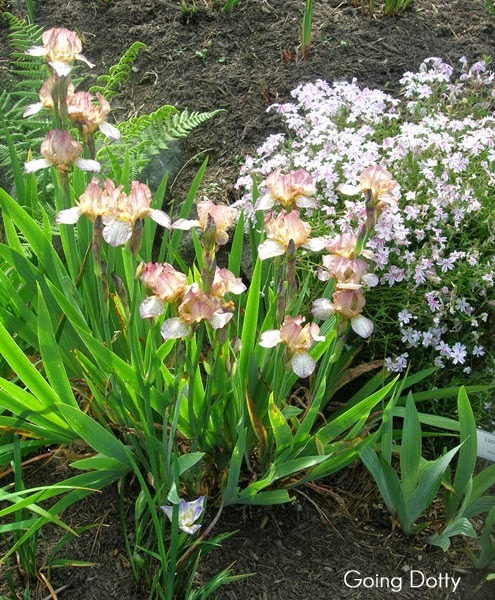 Maggie Asplet lives, gardens, and hybridizes irises in Gisborne, New Zealand. 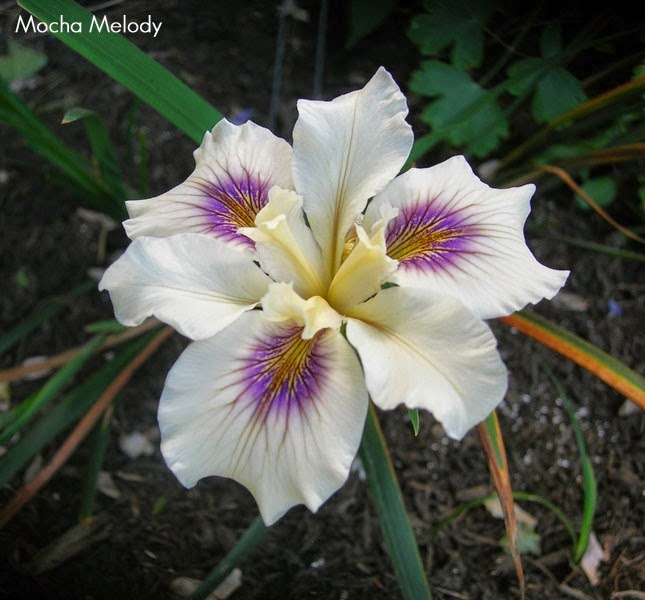 She is the Webmistress for the New Zealand Iris Society and a member of her local iris society. 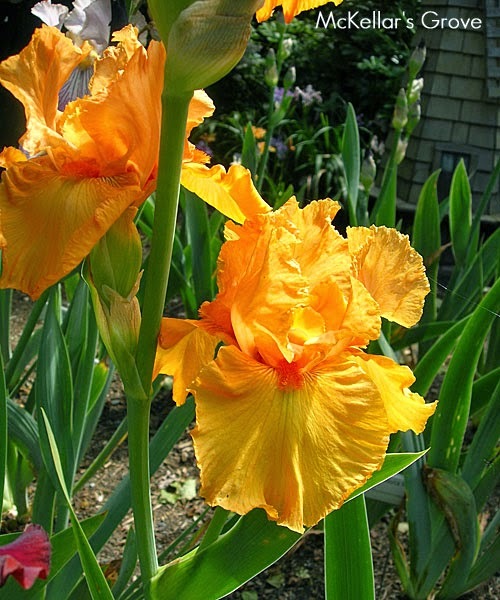 She began with just six irises from her mother's garden, and she currently grows over 1,000 varieties of TBs, IBs, BBs, SDBs, MDBs, Louisianas and species irises. Ernie Lamont began growing hydroponic vegetables after tasting the results on a vacation to Norfolk Island. 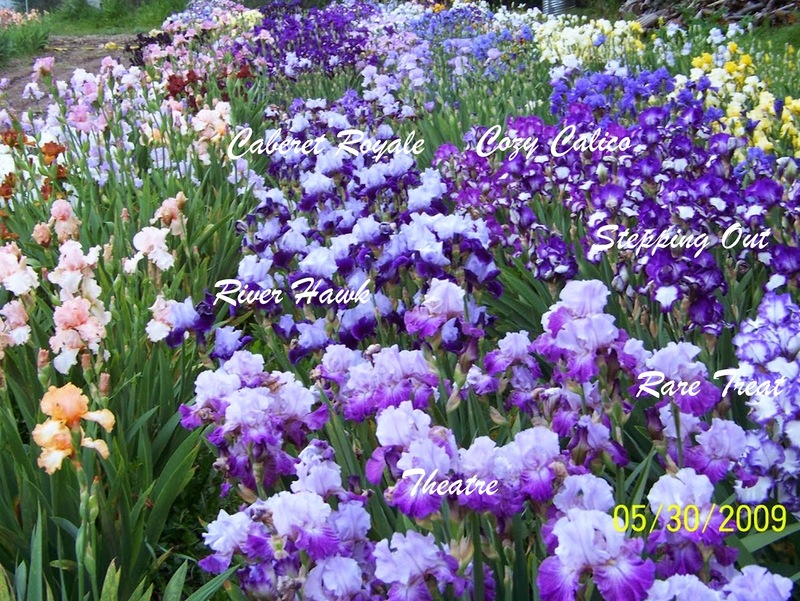 He became involved in the iris world as a volunteer for his local iris society, setting up staging areas for iris shows. His collection has expanded to 70 varieties, with 12 grown hydroponically. 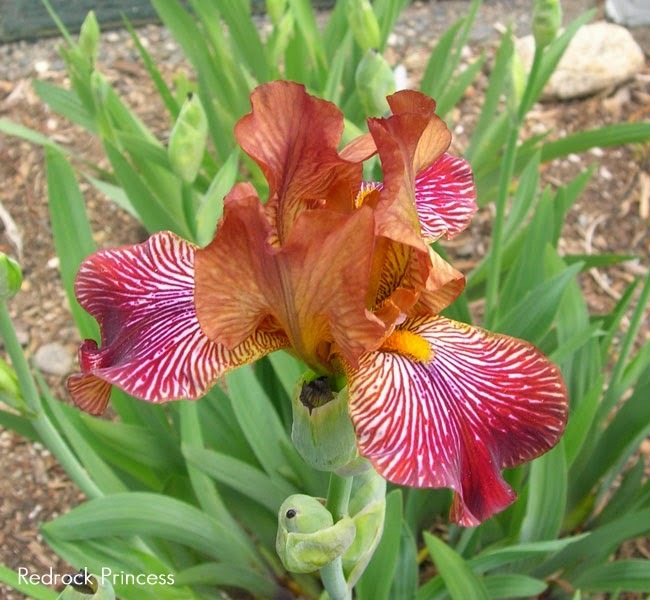 The Dykes Memorial Medal is the highest award an iris variety can win and is highly coveted by hybridizers. 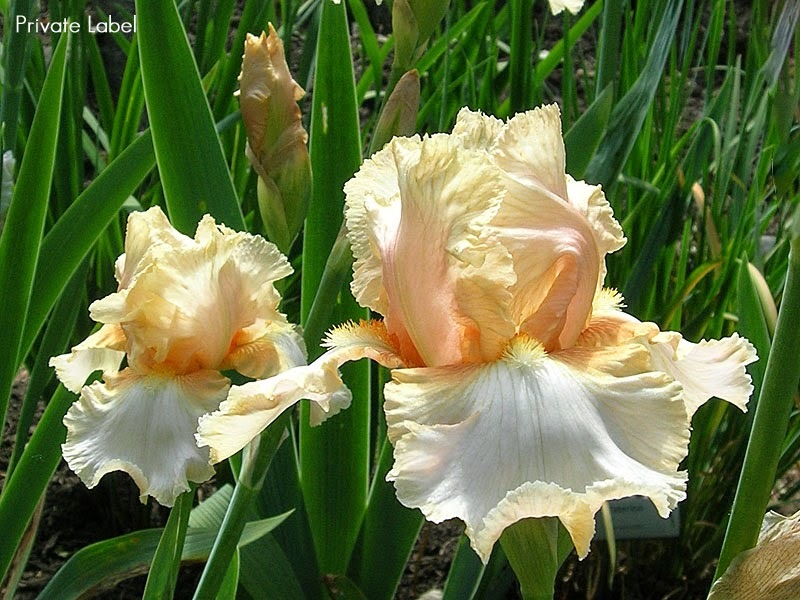 It represents, we hope, the creme de la creme of the iris world. But for every winner there are those that came so close, but didn't quite make it. 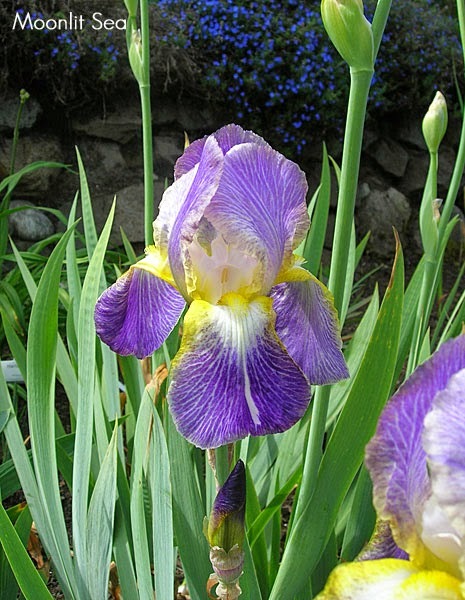 This is the story of two varieties thwarted from the top spot by the same iris. 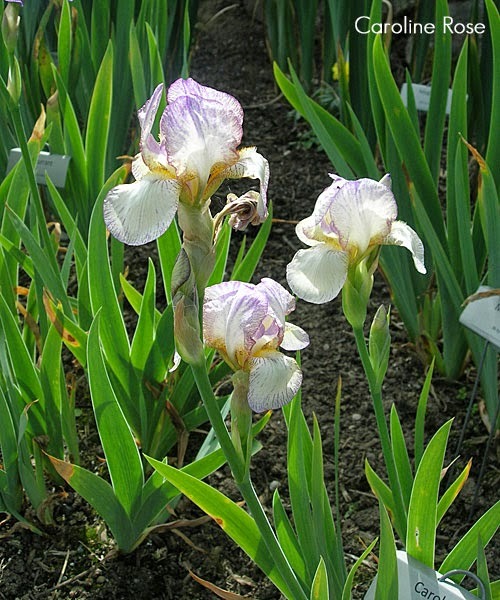 Dr. Rudolph E. Kleinsorge was a celebrated hybridizer in his day, introducing iris varieties from 1929 through 1961. 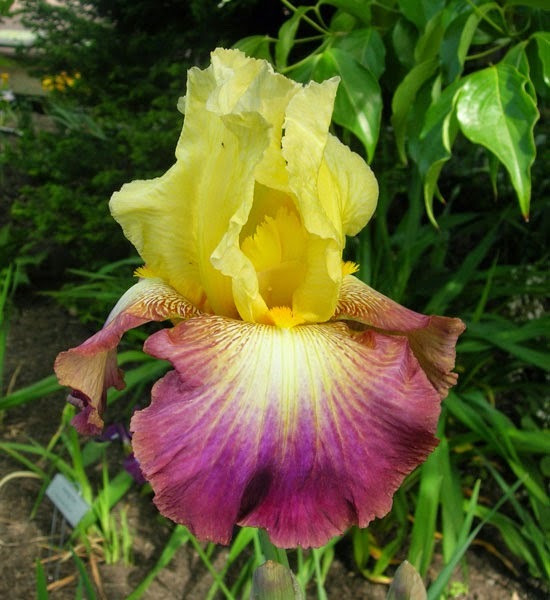 He created many significant varieties that were not only good garden plants but also advances in color that changed the iris palette forever. One thing he never did achieve was a Dykes Medal, however he did come very close. He thrice missed the top spot by slim margins. And, oddly, it was the same variety that beat his two of those times. 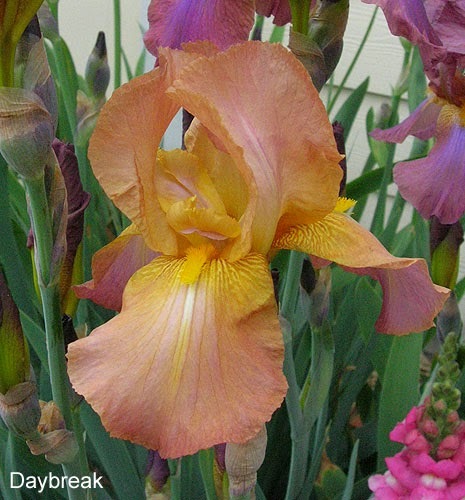 In 1945 his lovely pink blend 'Daybreak' came in second to 'Elmohr'. In 1946 it tied for the top spot with 'Ola Kala', the renowned golden yellow masterpiece from Jacob Sass, and no award was given that year. In 1948 the Doctor's next great advance, 'Bryce Canyon', was a runner up to that year's winner - 'Ola Kala'. Talk about a curse! 'Ola Kala' was not OK for the good Doctor*. 'Ola Kala' deserves its place. 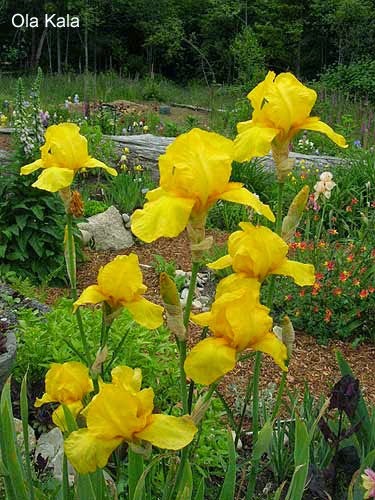 It was an amazing advance for yellow irises, bringing great depth of color, lovely form, and much needed height to a class that was begging for improvement. It is sad that it eclipsed the fine advances that both 'Daybreak' and 'Bryce Canyon' also brought to the table, but such is the cast of the die. Thankfully all three of these wonderful varieties are still with us, and we can grow them and judge for ourselves which are deserving in our own eye of top honors. *Much thanks to Phil Edinger for the info and clever turn of phrase that inspired this post. 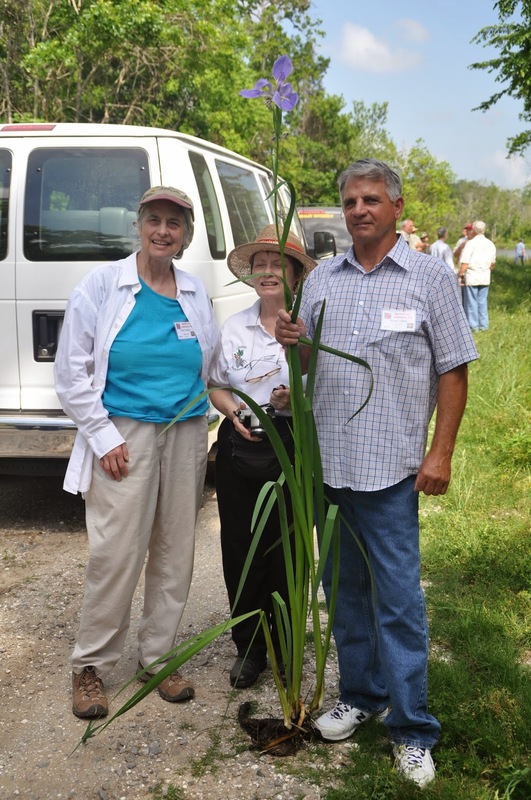 Louisiana Iris Convention Coming Up! Have you sent in your registration for the Louisiana iris event of the year? 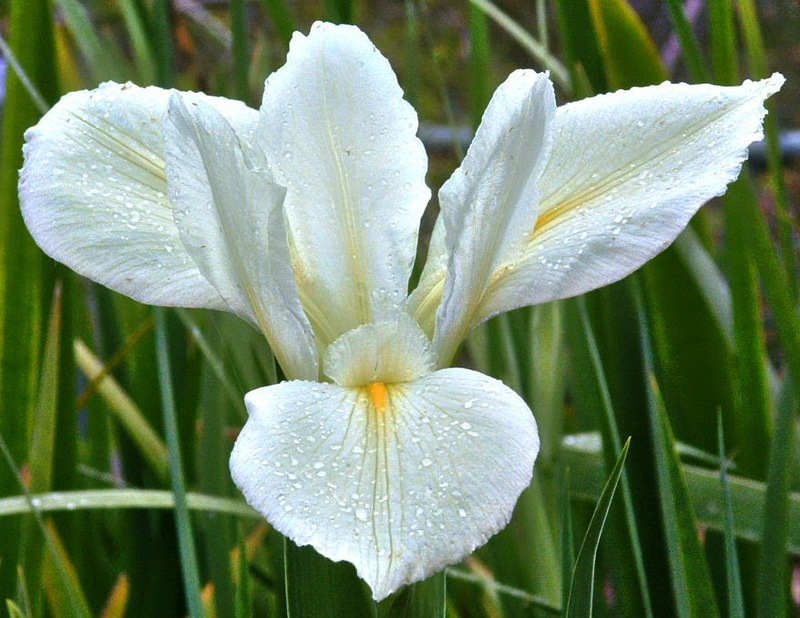 The 2015 Society for Louisiana Irises Convention is just about a month away. Make sure you don't get closed out of any tours or other great times. Space is still available. 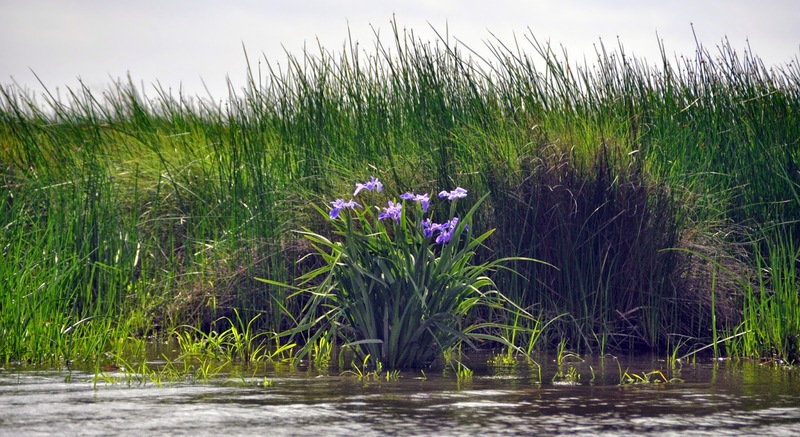 Visit beautiful Acadiana in the spring.Talk irises with people from all over the country. Great food, great people, amazing irises, what's not to love? You may even want to extend your visit and see what else awaits you in the heart of Cajun country. Don't miss this! Y'all come Pass a good time !!!!!! 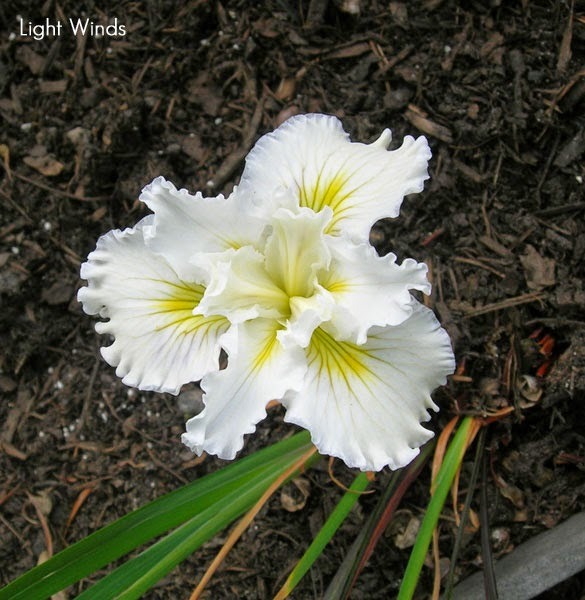 The Louisiana Iris is one of the most misunderstood yet versatile irises. It’s been called a water iris, which is not technically correct. Some will grow in water, some will not. If the foliage is totally submerged, they will most likely die. Most will grow well in bog conditions, but some will not. They have been grown from Canada to Mexico and in many countries abroad. They grow from the marshes and swamps of Louisiana to the deserts of Arizona. 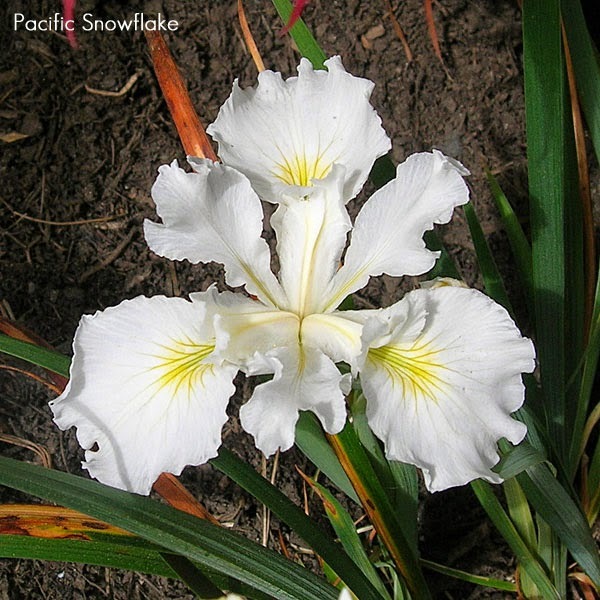 The secret to their successful cultivation is understanding the cultural differences of the five species that make up this diverse group of iris, and being able to recognize these traits. 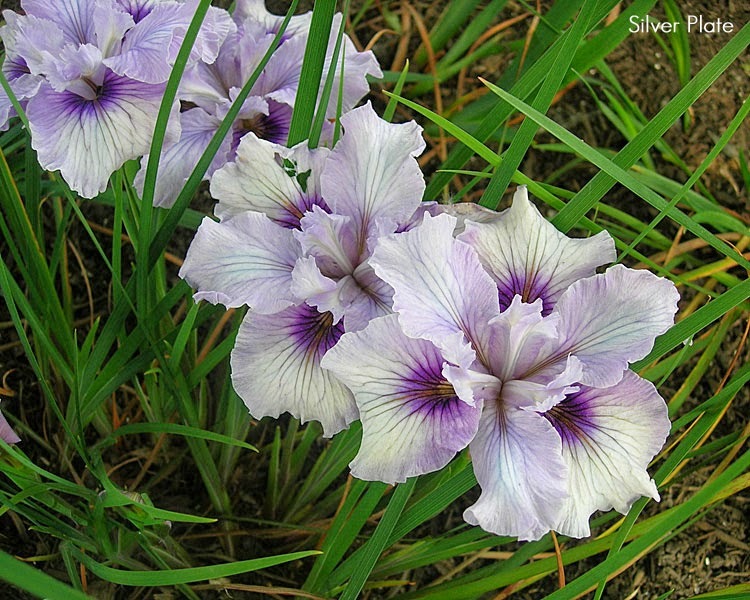 The species that make up Louisiana iris are I giganticaerulea, I fulva, I brevicaulis, I nelsonii, and I hexagona. Most of the new cultivars on the market today have all 5 species genes in them. My purpose here is to help you to look at a cultivar and recognize these traits, so that you will have some idea how this cultivar will perform in your garden and what culture requirements are best. 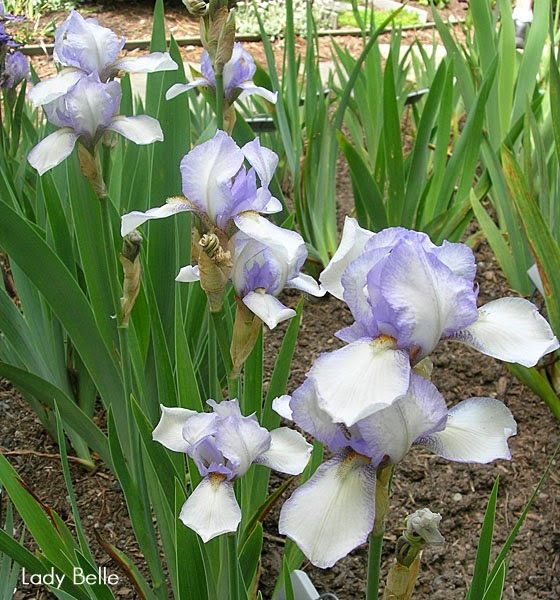 Iris giganticaerulea (or giant blue) is the tallest of the Louisiana Irises. It can grow over 6 feet tall in the right conditions. It was discovered and named by Dr.John K. Small in 1925 while he traveled by train through South Louisiana. In its native area I. giganticaerulea grows all winter. Hot, dry summers may bring on dormancy, with the plant all but disappearing until late August when the weather cools, and rains return. 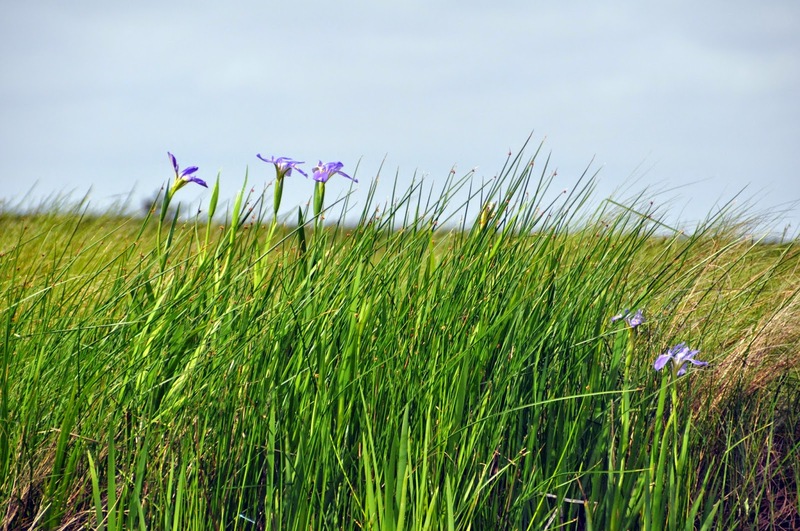 It is most commonly found in marshes, along bayou banks, in ditches, and the edges of swamps. It can be seen growing in as much as 2 feet of water. Even so, if the plant goes dormant during the summer, an early return of standing water can spell their demise if the growing tip is submerged for an extended time. I. giganticaerulea blooms very early in the spring with rapid bloom stalk development. The flowers are very large, generally 4-6 inches across. The color is a blue-purple with an underlying white. A white form, lacking the blue pigment, has been collected in the wild and brought into cultivation. They require a lot of sun during their growing season (winter in Louisiana), but will tolerate some light or afternoon shade in the peak of summer in that region. They possess tall, straight stalks with little or no branching. 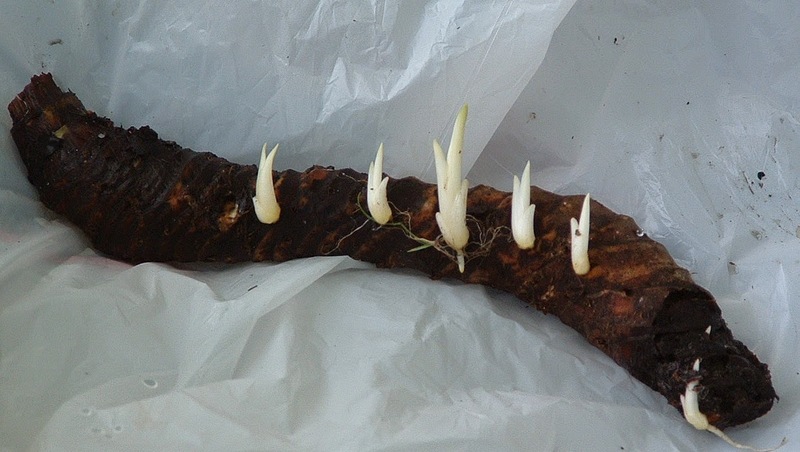 Their rhizomes tend to be large, and will often grow a foot or more in a growing season, causing the plant to travel. I. giganticaerulea’s core traits have an implication on their performance in various geographic locations. Because they bloom early, hybrids that have strong giganticaerulea traits may not perform as well in areas outside their normal range. Most commonly, unless the rhizomes are directly exposed to extreme temperatures (as in the case of frost heave), the plant will survive and grow, but might never produce bloom. 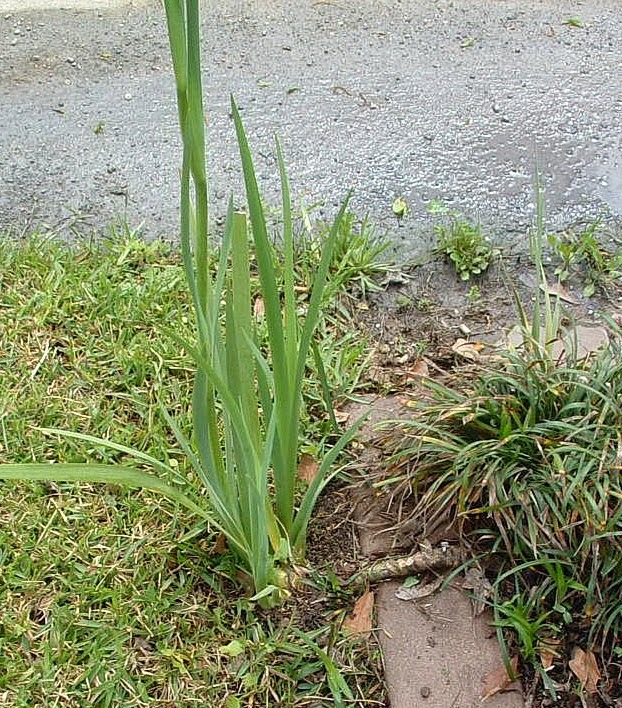 In New York State for example, where spring freezes are common, the tender, early bloom stalk will succumb to the assault. You will get a lot of lush green foliage all summer, but no flowers. Between the early bloom season, the tendency for the rhizomes to travel in beds, not to mention the need for division every two or three years, some find them a difficult plant to employ in a home landscape. These same traits make them ideal for landscaping around ponds, rain gardens and areas where too much water is a problem. Recognizing these traits in modern hybrids can help you select the best Louisiana cultivar for success. 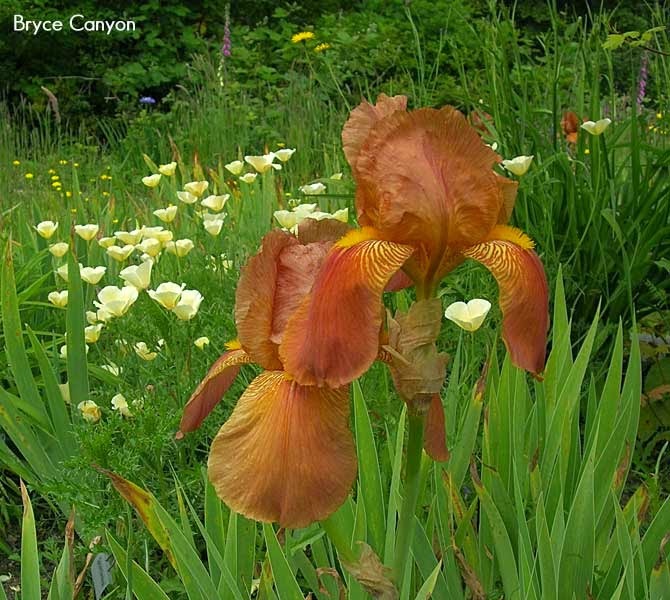 Here are more photos from my visit Leonine Iris in Skyway, WA. Bob Seaman has created a beautiful garden on this small city lot and has specialized in PCIs since 2009. 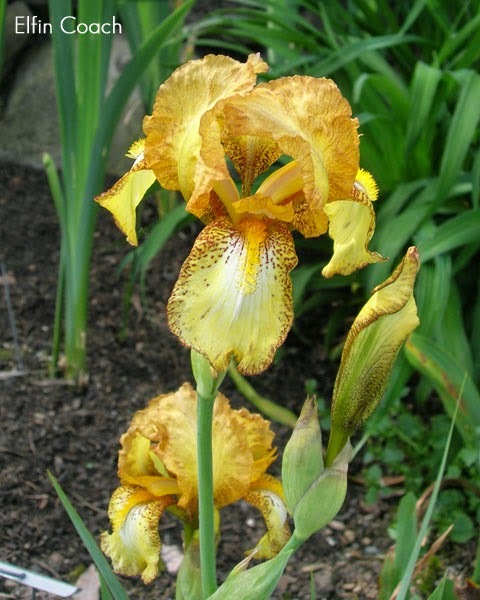 He has over 240 varieties, as well as a smattering of bearded irises and misc. other species, tucked into every corner, making excellent use of the small space. We were lucky to be there on a beautiful day when the sun was shining and the flowers - and visitors - were soaking it up. 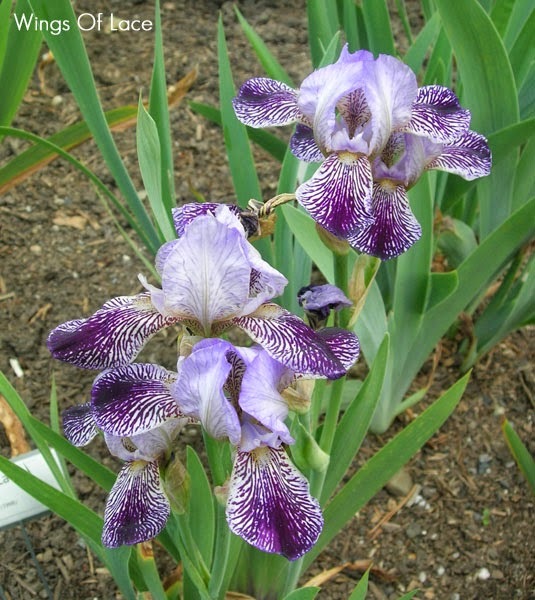 The following are some of my favorite bearded irises that I saw that day. I hope you have enjoyed this peek at the flowers in this wonderful collection. If you are in the Pacific Northwest be sure to plan a visit. The website tells me they are having another open garden on May 16th, 2015. I'll definitely be there. Here are more photos from my visit Leonine Iris in Skyway, WA, where I saw an amazing array of Pacific Coast Irises (PCI). Bob Seaman has created a beautiful garden on this small city lot and has specialized in PCIs since 2009. 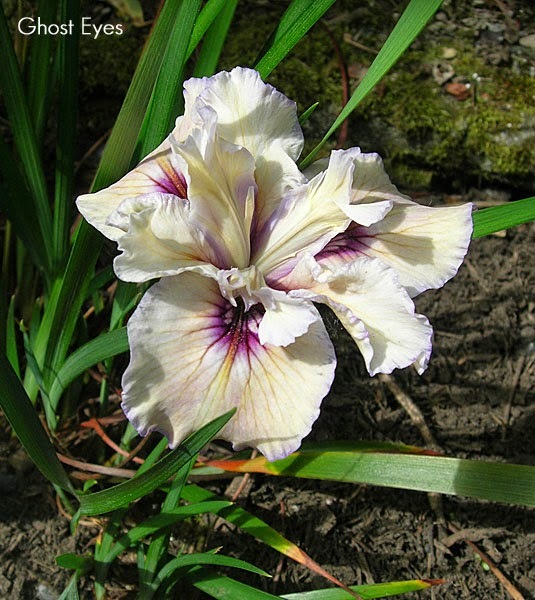 He has over 240 varieties, as well as a smattering of bearded irises and misc. other species, tucked into every corner, making excellent use of the small space. We were lucky to be there on a beautiful day when the sun was shining and the flowers - and visitors - were soaking it up. The following are some of my favorite blooms that I saw that day. For this last set of PCIs just some random varieties that didn't fit the previous posts. Tomorrow we'll see some of the bearded irises Bob is growing. Hope you enjoy them. What Surprises Will You Find In News & Notes?